Who would have thought I’d have an opinion about fashion! Another blogger pointed me to a current show in Toronto’s Royal Ontario Museum (ROM) called “Fashion Follows Form: Designs for Sitting”. I haven’t gone to the show yet, but I did visit the ROM website. It’s interesting, but not surprising, how fashion is normally designed around people who stand and walk. This show is about designing clothes around people who are in wheelchairs. What a fascinating subject to think about. I love that this is being thought of, and by being displayed at the ROM, hopefully it will get many people to change their views. It’s great that Canadians are thinking about these issues. It demonstrates an evolution of attitudinal change – here in Canada, we’ve have gone from debating curb cuts and basic access to fashion statements. I know we still have a long way to go on some of the more basic rights for people with disabilities, but I think this show is a step in the right direction. What struck me though is the existing huge gap between Canada and developing countries like Malawi, Zimbabwe or the Congo. For example, James Banda in Malawi was told not to go to school by his father because he had a disability. It’s a miracle that he went to school. I wonder what James and others like him would say if society began to change their attitudes on fashion for people with disabilities in Malawi! I confess that we’ve had some negative feedback from a picture we’ve shown in our printed publications. 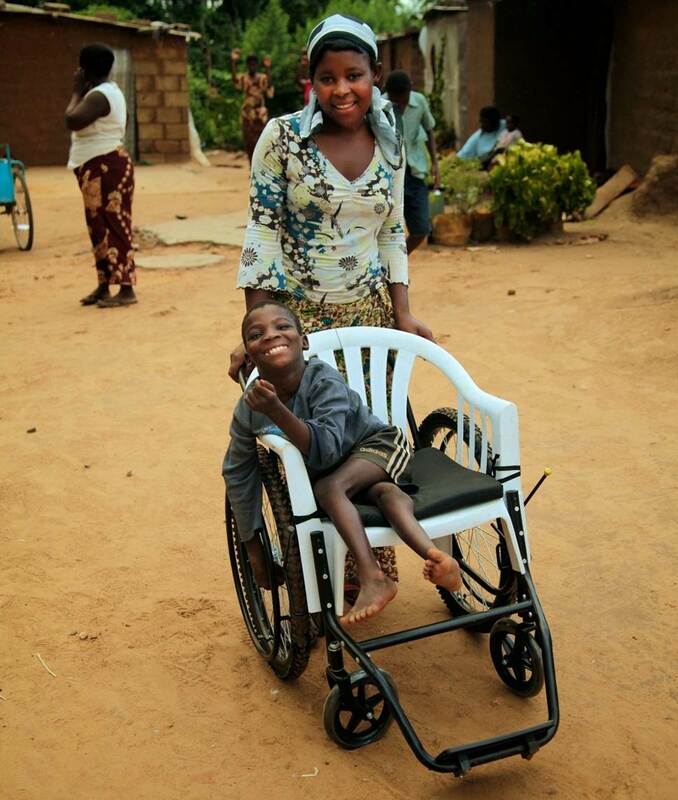 It’s a photo of Prince in a custom-made wheelchair in Uganda (see below). The wheelchair is far from perfect – it’s a plastic chair mounted on wheels. We would love to give him a better wheelchair, but at least with this chair, he has mobility. He is not restricted to crawling or living in a one room hut. I agree that we need to get Prince a better chair. When I think of Prince and his situation, I’m reminded of how many people are still forgotten in our world. How many people with disabilities are so far away from rights and luxuries we take for granted in Canada. Many children in developing countries, like Prince, need a wheelchair. I look forward to the day when people in developing countries like the Congo will have the luxury of thinking about fashion for people with disabilities!